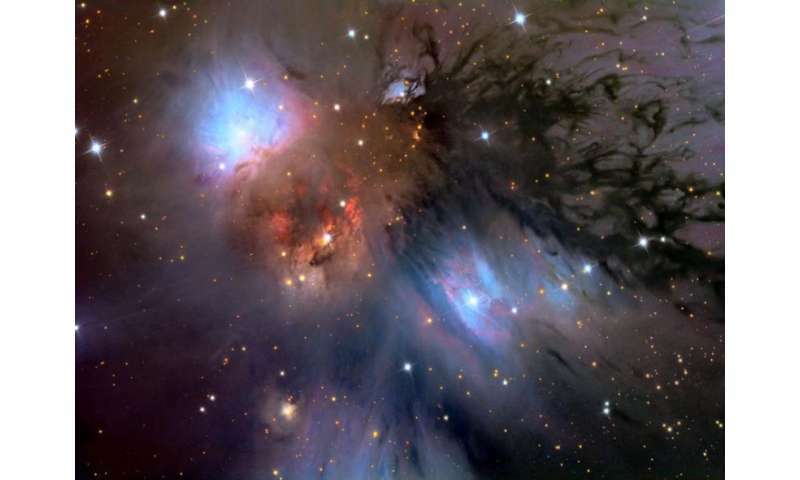 Stars form within the dense regions of diffuse molecular clouds, but the physical processes that determine the locations, rate, and efficiency of star formation are poorly understood. Recent thinking envisions an approximately two-step process: first, a network of dense filaments form due to large-scale turbulence and then fragmentation into cores occurs as gravity starts to dominate. In the dense gas the structure formation is affected by motions induced primarily by three processes: supersonic turbulence, self-gravity, and magnetic fields, although the role of each process is still debated. Recent research suggests that the statistical properties of the column density (for example, the numbers of cores denser than a fixed value) offer a key to unraveling structure formation mechanisms. Computer simulations of star formation show that if the number of dense cores having any particular density value is random, then turbulence is probably dominant, but if denser cores tend to cluster non-randomly, then gravity is probably dominant. CfA astronomers Scott Wolk and Phil Myers and their colleagues have analyzed the Herschel Space Observatory's five wavelength far infrared images of the giant molecular cloud Mon R2, looking for evidence of non-randomness in core formation. The far infrared images can be combined to map the dust densities (or more precisely, the dust column densities). The astronomers found that in lower density regions—in this Mon R2 characterized by a clear density cut-off—the distribution was indeed random, signaling the dominance of turbulence over most of the giant cloud. However, in the denser regions, self-gravity appears to be predominant. Moreover, the deviation from randomness can be quantified, and the scientists found that the measure of the variation correlates with the numbers of young stars seen in the vicinity. They even discovered some instances when a second value of this measure was needed for the densest regions. Although relating these findings to more fundamental issues like the star formation efficiency will require additional research, the new paper demonstrates that far infrared imaging techniques can provide critical insights into early stages of star formation. More information: "A Herschel-SPIRE Survey of the Mon R2 Giant Molecular Cloud: Analysis of the Gas Column Density Probability Density Function," R. Pokhrel, R. Gutermuth, B. Ali, T. Megeath, J. Pipher, P. Myers, W. J. Fischer, T. Henning, S. J. Wolk, L. Allen and J. J. Tobin, MNRAS 461, 22, 2016. "...but the physical processes that determine the locations, rate, and efficiency of star formation are poorly understood." Yeah, we are aware of this but thanks for reminding us anyway. You are being critical, but how do you propose that we improve our understanding without such research?